Prometheus by Gustave Moreau, (1868). 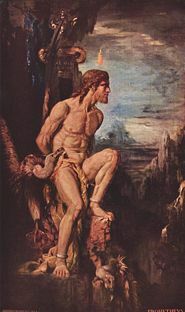 In Greek mythology, Prometheus (ancient Greek: Προμηθεύς, "forethought") is the Titan honored chiefly for stealing fire from Zeus and giving it to mortals for their use. For this transgression, Zeus ordered that Prometheus be chained to the summit of the Caucasus Mountains for eternity. On each day that followed, an eagle would come and eat his liver. Since Prometheus was immortal, his liver always regenerated, and so he was left to bear this horrible pain every daily. 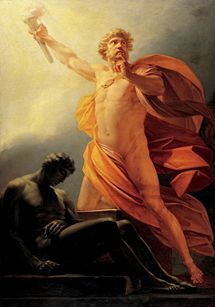 Prometheus is commonly depicted in myth as an intelligent and cunning figure who had sympathy for humanity; today, the term "Promethean" is used to describe people who are connected with great creativity, intellect, and boldness. Prometheus was a son of the Titan Iapetus by Clymene, one of the Oceanids. He was also a brother of Atlas, Menoetius, and Epimetheus (the "one who thinks too late;" his polar opposite). He surpassed each of these siblings in cunning and deceit. He would go on to become the father of Deucalion with Pronoia. It was Prometheus who warned Deucalion of Zeus' plan to send a flood to destroy humankind, and subsequently advised his son to build an ark in order to sail to safety. In general, Prometheus was not fearful of the gods, and he openly ridiculed Zeus, although he was favored by the supreme god for his assistance in the fight against Cronus. Furthermore, it was Prometheus who helped cure Zeus of a particularly horrendous headache. No healer was able to emancipate the king of the gods from this ailment, and so Prometheus came to him and declared that he knew the appropriate remedy, then promptly took a rock from the ground and hit Zeus over the head with it. Out of the wound on Zeus' head climbed the Goddess Athena, and Zeus' headache disappeared. Alternative versions of these myths identify Hephaestus or Hera, rather than Prometheus, as the individual who split Zeus' head open. Prometheus, in Ovid's Metamorphoses, is credited with the creation of human-beings "in godlike image" from clay, a role which is assigned to Zeus in other variations of the creation myth. According to the myths, Prometheus and his brother Epimetheus were ordered by Cronus to make creatures that would populate the earth. Prometheus carefully crafted a creature after the shape of the gods: A man. Prometheus and Epimetheus journeyed to Earth from Olympus, then ventured to the Greek province of Boitia and made clay figures. Zeus took the figures and breathed life into them. The figures that Prometheus had created became human beings and honored him. The figures that his brother Epimetheus had created, meanwhile, became the beasts, which turned and attacked him. Zeus was angered by the actions of Prometheus and Epimetheus, and he forbade the pair from teaching humanity the ways of civilization. Athena chose to go against Zeus and taught Prometheus so that he might teach humanity. For their actions, Zeus demanded that a sacrifice be made to the Gods from human beings to demonstrate that they were obedient and worshipful. The gods and mortal man had arranged a meeting at Mecone where the matter of division of sacrifice was to be settled. Prometheus slew a large ox, and divided it into two piles. In one pile he put all the meat and most of the fat, cleverly covering it with the ox's grotesque stomach, while in the other pile, he dressed up the bones artfully with shining fat. Prometheus then invited Zeus to choose a pile for the gods. Zeus, however, saw through the trick, but nonetheless chose the pile of bones, since he realized that in willfully getting tricked he would have an excuse to vent his anger upon mortal humans. Alternative sources claim that Zeus did not, in fact, see through this ruse. This provides a mythological explanation for the common practice in ancient Greece whereby worshipers would sacrifice only bones to the gods, while keeping the meat and fat for themselves. In his wrath, Zeus denied humankind the secret of fire. In the wake of this punishment, Prometheus watched his creations as they shivered though the cold winter nights and was overcome with sympathy. He decided to give his most loved creation a great gift. He stealthily stole fire from the hearth of the gods and brought it to humans in a hollow wand of fennel that served him in place of a staff. He brought down the fire and gave it to the humans, then instructed them as to how they could cook and stay warm. Prometheus Bound, by Scott Eaton, (2006). Zeus was enraged by Prometheus' insubordinate action. However, Zeus could not simply take fire back, because a god or goddess was not able to take away what another had god or goddess had given. For Prometheus' act of hubris, Zeus devised a punishment that would suppress all of humankind while rendering Prometheus unable to succor them. Zeus had Prometheus carried to Mount Caucasus, upon the summit of which he was bound to a rock. Here an eagle by the name of Ethon would arrive daily to peck at his liver. Since Prometheus was immortal, his liver would grow back each day, and so the eagle would be able to eat it again. In other variations of this story, Zeus has Prometheus tortured on the mountain because he had come to know the name of the person who, according to prophecy, would overthrow the king of the gods. This punishment was to last for eternity. 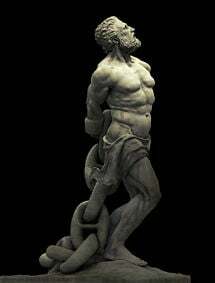 About twelve generations later, Zeus's very own son Heracles, passing by on his way to find the apples of the Hesperides as part of his Twelve Labors, freed Prometheus. Once free, Prometheus captured Ethon and ate the bird's liver as revenge for his pain and suffering. Zeus was not overly perturbed upon hearing that Prometheus had again evaded his punishment, as the act brought more glory to his son. However, there was a problem, since Zeus had already decided that Prometheus would be tied in the rock for eternity. According to Greek mythology, this could never change, even if Zeus himself wished it. Finally, a solution was found: Prometheus was invited to return to Mount Olympus and was given a ring by Zeus that contained a piece of the rock to which he had been previously bound. Prometheus liked this ring and decided to wear it thereafter for eternity, technically fulfilling the conditions of Zeus' earlier decree. To punish human beings for the offenses of Prometheus, Zeus told Hephaestus to "mingle together all things loveliest, sweetest, and best, but look that you also mingle therewith the opposites of each." So Hephaestus took gold and dross, wax and flint, snow and mud, honey and gall, the bloom of the rose and the toad's venom, the voice of laughing water and the peacocks squall, the sea's beauty and its treachery, the dog's fidelity and the wind's inconstancy, and the mother bird's heart of love and the cruelty of the tiger. All these and other contraries beyond enumeration he blended cunningly into one substance and this he molded into the shape that Zeus had described to him. What resulted was a maiden as beautiful as a goddess, who Zeus named Pandora which meant "all gifted." Zeus breathed upon her image, and it lived. The king of the gods sent her to wed Prometheus' brother, Epimetheus, and although Prometheus had warned his brother never to accept gifts from the Olympians, Epimetheus was love-stricken, and he and Pandora wed. The gods adorned the couple with many wedding gifts, and Zeus presented them with a beautifully wrought box, known today as Pandora's Box. When Pandora opened the box, all suffering and despair was unleashed upon humankind, and Zeus had finally taken his revenge. As the introducer of fire and inventor of crafts, Prometheus was seen as the patron of human civilization, thus, it is not surprising that he was commemorated to some extent in Greek worship. A small shrine to Prometheus was located in the Kerameikos, or potter's quarter, of Athens, not far from Plato's Academy. As is common in many altars and votive reliefs to Prometheus, he was honored in an altar with Hephaestus. In the Akademia, located just outside of Athens, there stood another altar to Prometheus, from which athletes raced to the city carrying burning torches. The contest involved keeping the torch alight while running; if the torch of the lead runner came to be extinguished, he lost his claim to victory. The festival during which these torch races took place was known as Promethia. In Argos, the chief city of Argolis in Southern Greece, the citizens kept a tomb of Prometheus and honored him as a dead hero. The city of Opous in Central Greece also claimed to honor a grave of Prometheus. 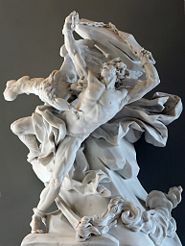 Prométhée enchaîné (Prometheus Bound) by Nicolas-Sébastien Adam, (1762). Prometheus chained to a rock having his liver torn out by the eagle Ethon. The myth of Prometheus is one of the most popular Greek myths, and has enjoyed reverberations in art, literature, and even science. His story has inspired many authors, composers, and artists throughout the centuries, and various works have been created that either allude to Prometheus or use his story as a template. Among the most famous of these are the play Prometheus Bound, traditionally attributed to Aeschylus (525-456 B.C.E. ), and Mary Shelley's 1818 novel Frankenstein, the alternative title of which is The Modern Prometheus. The following year, Shelley's husband, Percy Bysshe Shelley, also contributed a play with similar themes entitled Prometheus Unbound. Shelley, among other Romantics, saw Prometheus as the prototypical genius. Prometheus inspired a number of poems in which he was the titular character, such as those by Johann Wolfgang von Goethe and Lord Byron. Ludwig van Beethoven provided a musical composition inspired by the Promethean myth entitled Die Geschöpfe des Prometheus, op. 43. Additionally, Prometheus is alluded to in the works of literary giants such as Shakespeare, Franz Kafka, James Joyce, and Thomas Hardy. In the twentieth and twenty-first century, Prometheus has also been a subject of numerous avenues of popular culture in general, spanning a gamut of mainstream media including fiction, film, and comic books. Additionally, Prometheus has also been widely acknowledged by science, as he represents the continuous unraveling of human understanding. As such, many scientific discoveries have been given his name. One of Saturn's inner satellites is named Prometheus after the Titan, as is the asteroid 1809 Prometheus. The name for the sixty-first element Promethium is also derived from Prometheus. In 2003, the first ever cloned horse to be born from and carried by its cloning mother was named Prometea, the feminine form of Prometeos, the Italian form of "Prometheus." ↑ C. Galli, et al., 635. Galli, C., et al. "A cloned horse born to its dam twin." Nature 424 (Aug. 7), 2003. 635. All links retrieved June 5, 2015. This page was last modified on 5 June 2015, at 14:42.